I turned up at the garden centre yesterday to realise we hadn't agreed whereabouts in the garden centre we'd meet. I'd not met the person before, and whilst we both did have a LinkedIn profile picture to refer to, in a busy garden centre that wasn't going to be of much help. I headed for the cafe entrance, and when they hadn't appeared at the agreed time I decided they might be waiting for me inside the cafe, and so walked in and looked around hoping to get eye contact with someone who was looking for someone who looked like me! Isn't that what we're doing all the time - communicating and thinking it's clear, and only realising the error of our ways when we come to act on the communication. It's just too easy to get it wrong without realising it. I've written a lot about communication here on the Purchasing Coach blog, and today thought I'd share the top 10 things to remember when communicating with others - ie the aspects of communication that I think make the most difference. The intended outcome of the communication - the why? An internet search suggests we might want to include: body language, non verbal communication, listening, clarity, empathy, friendliness, confidence, open-mindedness, respect, questioning, reflecting, clarification, rapport, charisma, assertiveness and so on and on. As you reflect on this list are there any that surprise you? Have I missed anything? Which of these topics would you consider you excel in? What about areas for development? I'm not suggesting I disagree with any of the above topics. I just think if we're not careful we end up over simplifying the nuances that can often result in miscommunication. It's these nuances I'd like to highlight in this top 10. The other person does not have the same information as you do, they don't think like you do, and they have different preferences to you. It's very dangerous therefore to assume they're just like you, and to tell them what you'd like to hear just as you'd like to hear it. More here. With so much information to take in we can only take in a small fraction of that information. We therefore have to filter the data, and the means by which we filter include our memories, beliefs, and values. More here. Values motivate our actions and help us achieve what we achieve - they explain why some people are inspired to climb Everest, and why others have never left their home town. Values are also the means by which we judge others. That is, I might get very angry about how someone is behaving towards me, and someone else can look on and wonder why I've got into such a state. The difference in reaction will be due to our values - the person is compromising one of my core values, and not any of the other person's. More here on your values, and this on respect (because we all have different definitions of what it looks, sounds and feels like). I've also written a post on how to take account of stakeholder's values in your communication too. There's likely to be circumstances where you also demonstrate the same behaviour, that you're experiencing from the other person, and yet you're getting frustrated with them about. More here. We use words assuming that there's common understanding about what those words mean, and that there will be a positive impact. I use chocolate in workshops as an example of how many different representations we might have for such a seemingly simple word. Other posts have looked at the different responses to words such as answers vs solutions, transformation and change, and indiscriminate use of 'they' when apportioning blame for the current situation. 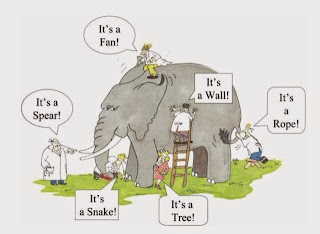 The sayings we use also provide such a rich source of information to help find solutions whether that's going around in circles, or can't see the wood for the trees. If you're having problems communicating with another person the quickest way I know of obtaining insight is to stand in their shoes. To physically imagine standing in their shoes. It's one of the most frequently used tools in my training and coaching sessions. I'd suggest I have a 75% success rate of using it with others, and obtaining helpful insight. More here. One of the most frequent responses when someone is asked to flex their style during training or coaching sessions is "why do I have to change - why can't I just say it as I want to say it, and make them adapt to my style rather than me adapt to theirs." 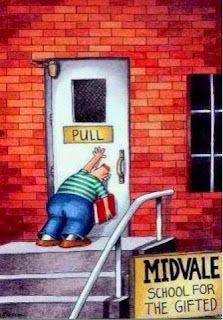 My response in training sessions often involves me enacting this picture, where understanding between you and the other person is the door. You can push all you want but understanding will only be achieved if you open the door. It's no surprise that miscommunication arises when we often rush into a meeting having taken no time to prepare or catch our breath, sometimes without eating, drinking water, and perhaps even after an argument with someone before. It is imperative, therefore that we consider our own state before any meeting, and have a handy strategy for shifting into a resourceful and appropriate state before walking through the door. See links for how do it in meetings here, and how to develop your own prescription for positivity. If a picture paints a thousand words, then a metaphor paints a thousand pictures. I can talk to a stakeholder all day using procurement speak and data we find interesting, and bore them senseless. Yet talk about needing to feed, weed, prune, mow, and water suppliers, just like you would plants in a garden, and they're engaged and asking what they can do to remove the tree/supplier that's uprooting the foundations. More here. Use of unconventional tools can often help to bypass the resistance we have to change or finding a solution. We used pipe cleaners in a workshop last year where we were exploring what turned out to be different aspects of communication gone wrong with stakeholders and suppliers. If you're still unconvinced you may want to read my post 'where has convention every got us'. I'd love to know what you would have included in your top 10 of things to remember when communicating - do please leave comments below. What soft skill would you like to develop, and what steps can you take to start the journey? Unlocking Procurement Potential Using Unconventional Tools. 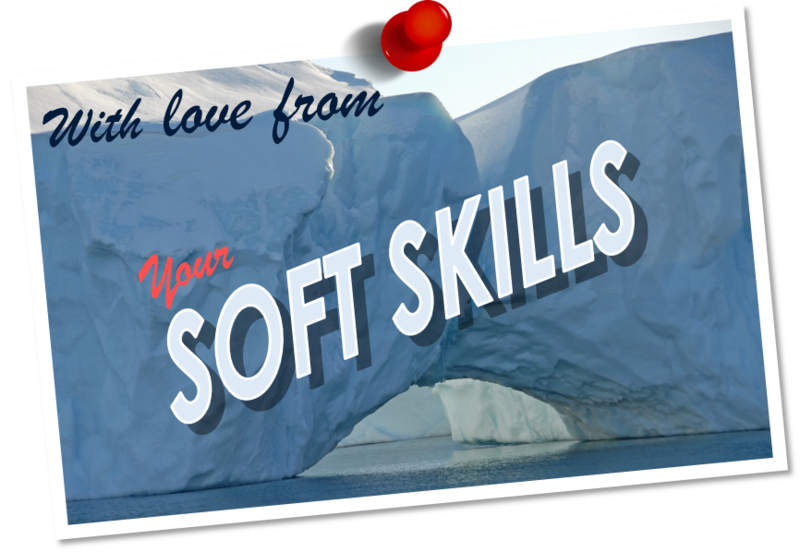 A selection of postcards written to procurement from your soft skills have been brought together in the Purchasing Coach Soft Skills Toolkit. You can find more about buying the Toolkit here - for personal use (at a cost of only £4.99) or organisationally (cost on request). The aim of the postcards is to bring soft skills development out of your subconscious, and into your conscious awareness. Doing that enables you to start an exploration about what the soft skill is all about, what the benefits might be if used effectively, what your level of competency is with respect to that skill, what good and not so good looks like, and how you might develop the skill further. 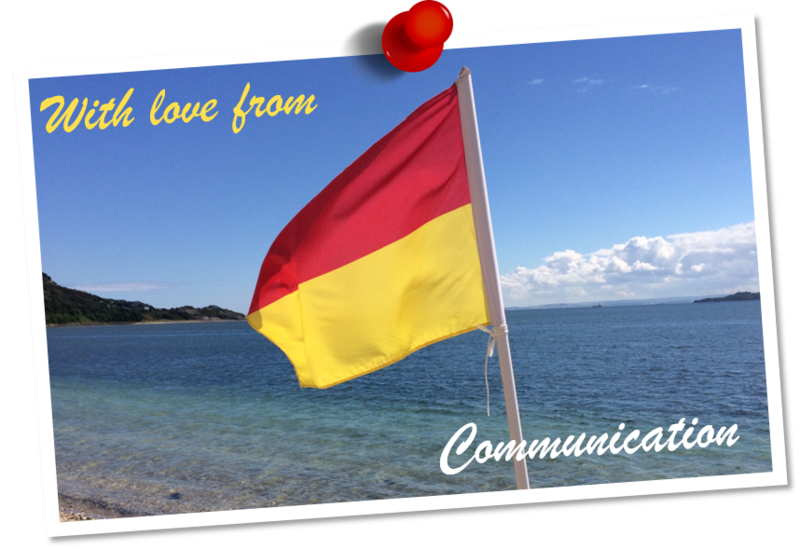 Other postcards shared on this blog have covered an introduction, change management, emotions, confidence and there's also a post on how to use the postcards to develop your soft skills (on your own or in groups). A toolkit entitled Dear Human, with love from your Soft skills has also been developed, and is available for non Procurement professionals wanting to develop their soft skills. We were thinking about the postcard that emotions sent you earlier in the week, and were wondering whether many people would even consider their emotions to be a soft skill. Perhaps they're not in the truest sense of the definition. 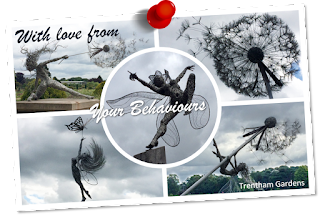 What emotions do have though is a huge impact on the outcome of your behaviours. You can be an expert at doing something, but if fear, sadness or anger take hold, your ability to use those expert skills may just go out of the window. 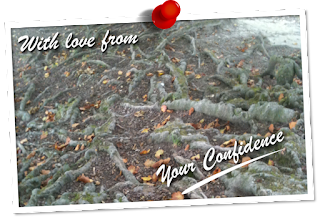 Confidence may not strictly be a single emotion either, more an amalgamation of a number of emotions, but we're certainly something that if you don't manage well can significantly impact the outcome you achieve. We'd love to help you achieve your goals, and yet we're often taken for granted or ignored. There's so much you could do to access us more often, and yet you act as if you have no control over our appearance or disappearance. We've sent a picture of tree roots because they remind us that when you're grounded in the moment (some might say the NOW), and authentically yourself (with no 'shoulds' 'oughts' or 'musts') you are confident. What can you do every day to ensure the relationship between us supports your goals, rather than prohibits success being a reality? 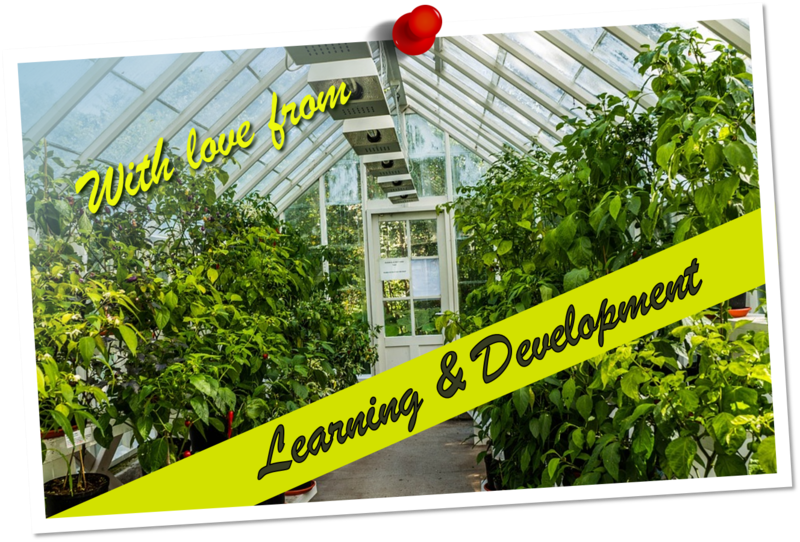 Other posts using the theme of postcards written to procurement from their soft skills have covered an introduction, change management, emotions and a post on how to use the postcards to develop your soft skills (on your own or in groups). 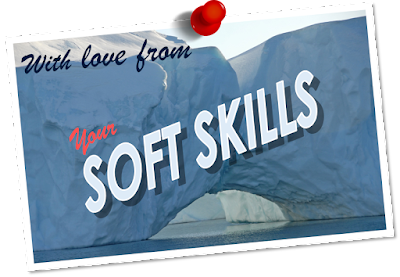 A selection of postcards from others of your soft skills have been brought together into the Purchasing Coach Soft Skills Toolkit. You can find more about buying the Toolkit here - for personal use (at a cost of only £4.99) or organisationally (cost on request). "How do we use the Soft Skills postcards?" was one question arising from a discussion about the newly launched Purchasing Coach Soft Skills Toolkit. The toolkit contains a series of postcards written to Procurement from a selection of Soft Skills - there's been a couple of blogs to give you a flavour so far - one on Change Management and one on Emotions. As with any of the unconventional tools I use in my coaching or training there's always a positive intention behind using them. ALWAYS. In this instance the postcards have been written with the aim of starting a conversation about Soft Skills - what are they? what do they help you achieve? what are the implications of not using a Soft Skill well or at all? how is your relationship with them currently helping or hindering you? what does good look like? what about not so good? what steps might you want to take to develop a particular Soft Skill more fully? when will you take those steps? how will you check the outcome or impact of those actions? and so on. The postcards just provide these discussions with a different perspective or two. In preparation for the launch of the Hays Procurement Salary Guide and Insights 2017 we were looking at the insights from 2016. Unfortunately I'm not sure it was such a good idea, as we ended up being very upset to see that only 46% of those participating thought Change Management was an important skill, where as 80% thought Communication and Soft Skills were. Ignoring the semantics of whether Change Management is a soft skill, we're a little puzzled by the outcome. To that end, we've invited Problem Resolution and Creativity over for a meal during the week to help explore what we could be doing differently to raise awareness of how much of what Procurement does involves Change Management. If you're putting in place a new system, a new process or wanting a wider set of KPIs we're involved. If you're changing suppliers we're involved both internally and externally. If you're developing sourcing, category or relationship strategies were involved. We're also involved if you're wanting to implement or roll out a new contract. In short there's very little of what you do that doesn't include us. We agree Communication and Influencing skills are great, but how you use them is informed by what you're wanting to do, and if that involves change then there's other factors at play that you need to be aware of before you can decide on a communication or influencing strategy. It would seem we need to adopt some of our own models to help you change your views about what we're saying. We may need to go back and review the different words we use to depict change. We look forward to making the journey with you, so that together we can truly transform organisational Procurement. 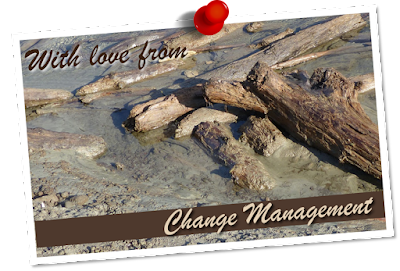 The aim of the Postcard is to provide some food for thought about your relationship with Change Management. What other words are used instead of change management? Does the choice of word have an impact on the recipient of the words? is that impact positive or negative? What are the different models of change management? When would you use them? What procurement activity does change management apply to? What activities would it not apply to? What are the implications or ignoring change management? What elements of change management do you need to consider before developing a communication or influencing strategy? What will you do to develop this skill further? Hopefully this example has given you a sense of just how useful these postcards could be as personal or team prompts to develop soft skills within your organisation. Always happy to help with coaching, training, facilitation or development of a (conventional or unconventional) soft skills programme. How to buy, and more about the Purchasing Soft Skills Toolkit here. Like many emotions the timing of this card could be better. Here we are just starting to let the world know about the series of postcards from your Soft Skills, and we're already writing about emotions! At least Change Management managed to get a word in first yesterday. That's emotions for you - they're not exactly the thing you can predict nor manage - excitement can just come upon you with no advance warning, so too despondency. The reason for the card today is because we went to Falkirk at the weekend and saw this, and felt it was such a great image to represent your emotions. Yes of course, we could have waited a while before sending the postcard, but wouldn't we just be doing what it's too easy to do, and hold back emotions just like the lock gates in the postcard. What's your relationship like with your emotions? 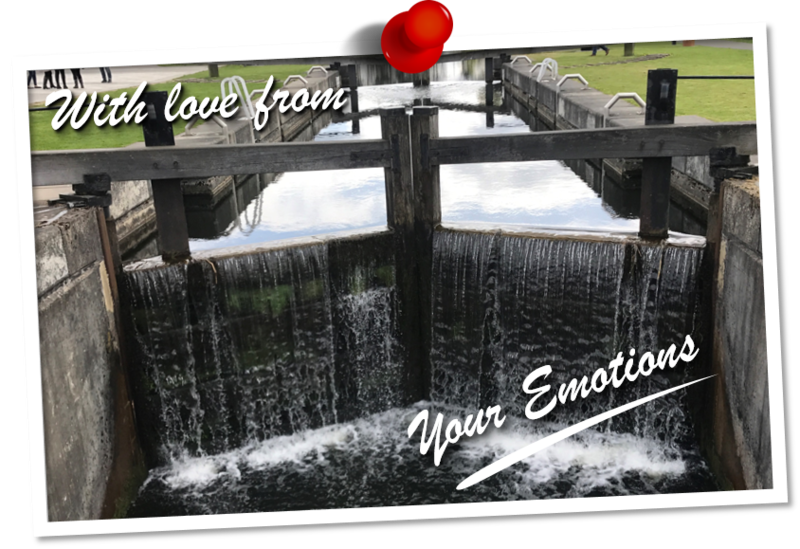 Who has responsibility for and access to the keys to open the lock gates to release the emotions being held back? 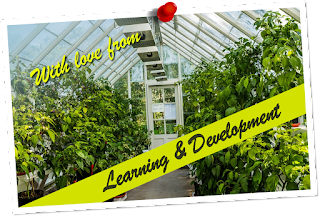 For more on the Dear Procurement, with love from your Soft Skills Purchasing Coach Toolkit see here. A more generic version entitled Dear Human Being, with love from your Soft Skills is also available here. Follow the link to a post providing an example of how to use the postcards to develop you or your team's Soft Skills. The above image is one of the postcards sent to Procurement from Change Management. 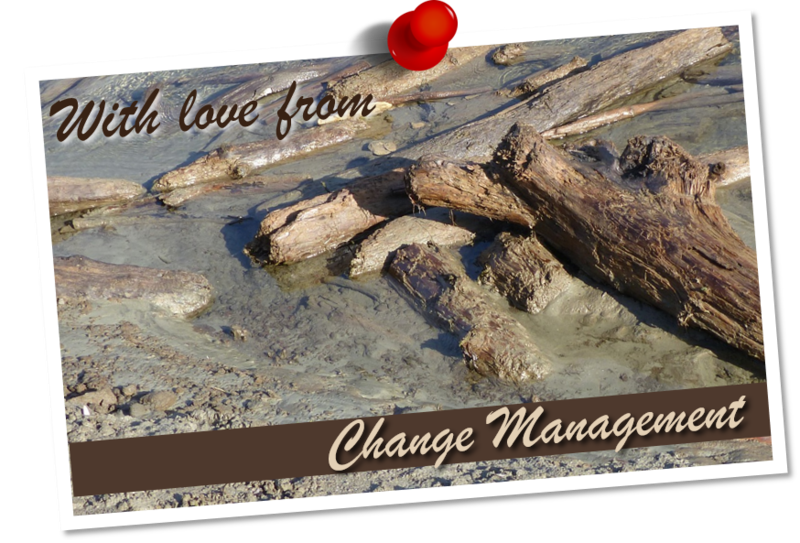 Where ever they go Change Management always seem to end up having to deal with the stick in the muds, as they shared in the postcard included in the Purchasing Coach Soft Skills Toolkit: Dear Procurement, with love from your Soft Skills! The toolkit includes a selection of postcards sent to Procurement from a number of their Soft Skills. Their aim is to engage procurement in a discussion about how to use Soft Skills more effectively. Yesterday's post was an introductory postcard, tomorrow's post is a postcard from your emotions. Follow the link to a post providing an example of how to use the postcards to develop you or your team's Soft Skills. There's also a few vlogs that provide insight into how a different perspective provided by the postcards might help. Like this iceberg we saw on a recent trip to Greenland there's more to Soft Skills than meets the eye. To understand more about whether your Soft Skills are hindering or helping you achieving your goals requires you to bring those very skills into your conscious awareness. To help support you in doing this, we've brought together a series of postcards written to you from a selection of your Soft Skills. For instance your Values and Communication went to the beach and enjoyed reflecting on the different motivations they had for what they did whilst they were there. Rapport went to Buckingham Palace, but as they looked for common ground they ended up sending a picture of the sky! Language went to the Kelpies, and Change Management went on a bit of a busman's holiday, and sent you a picture of a stick in the mud! We hope you'll agree that, whilst potentially unconventional, they're a very effective means of providing different perspectives to skills that are often taken for granted, ignored or even abused! We certainly hope you'll enjoy reading what we got up to on our holidays, and what insight we shared with you to help you develop your use of us more fully. your mental health and learning and development. Follow the link to a post providing an example of how to use the postcards to develop you or your team's Soft Skills. There's also a top 10 things to remember when communicating post that explores many aspects of these uniquely human skills. There's also a few vlogs that might help give you insight into the different perspective provided by these postcards. How often have you vented your frustration because someone has misunderstood something you've asked them to do, or got confused about the data you've sent them? It's easily done, especially when we think what we've communicated is clear and unambiguous. And it is - for us. 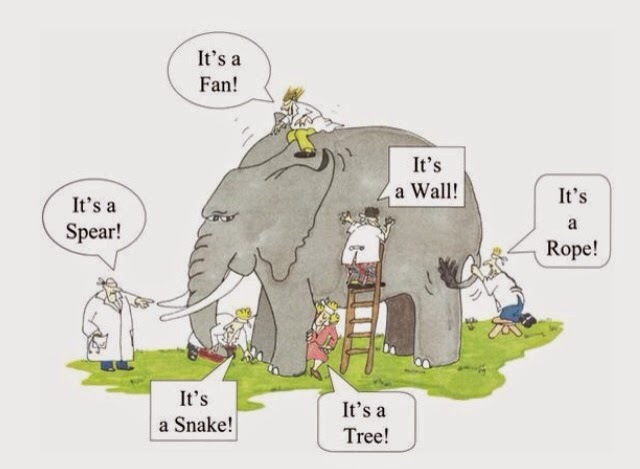 When communicating with others however it's useful to remember we don't all think the same. It's just like the difference between the iphone and android phones, or a Mac and PC - to make them all do the same thing we might have to press very different buttons. What we need to do to achieve the outcome we want only becomes clear therefore when we understand the operating model that the device is working to. It's only then that we'll understand that pressing a certain sequence of buttons means we get what we expect rather than the opposite. The Met office weather app is a great example of this - although it's me, the receiver of the communication, who's frustrated and not the Met Office. Which of the following views do you think it easier to understand? Current design of the diary they use every day - which is how they're used to visualising time - ie mine is: Days - left to right, Time - top to bottom in both electronic and paper formats. As I wrote the list I realise being happy with the left hand option for years is making it difficult for me transition to the new look. I also find the sheer volume of data on the right confusing. 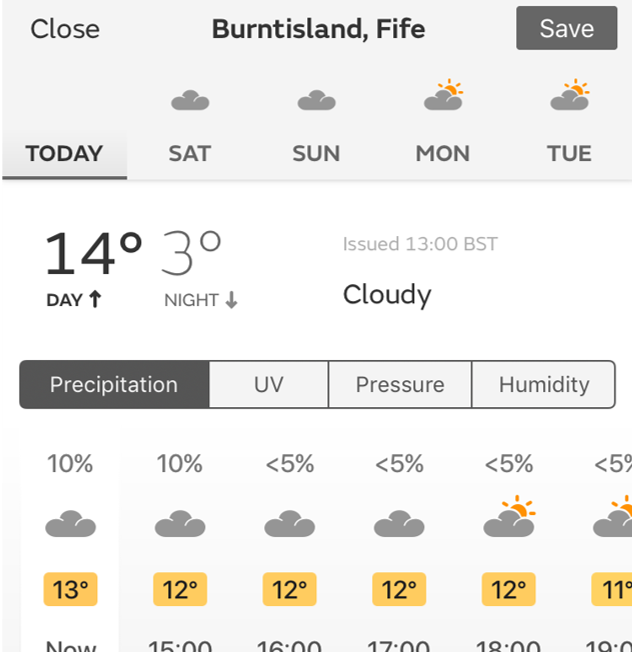 The biggest factor that my brain is finding hardest to assimilate though, is to look to the bottom of the page to pick a time to then look up for the forecast! Perhaps if I persist I may start to find meaning in the data - currently it just might as well be in a different language and I could cry with frustration. 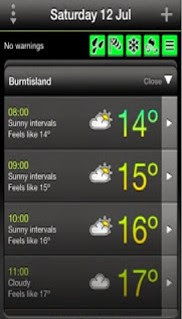 I'm certainly looking for alternate weather apps with views that meet my preferred means of taking info in. This is such a great example of what could happen every time we communicate. Like the Met Office I'm sure we think our message is clear and unambiguous, and as we understand the message so will the other person. 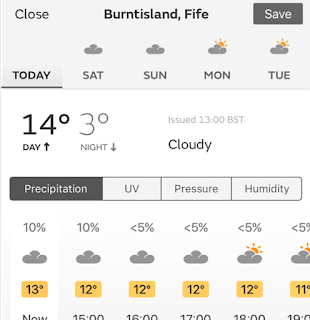 I'm sure many many people will - just like I'm sure many Met Office app users are finding the new visual presentation helpful. However, sometimes, we might just have chosen to present to our stakeholder using a means that is counter to their preferred means of making sense of the data. Which will certainly make it much harder, if not impossible, for them to understand what we're telling them. Despite MS's best efforts when we move powerpoint documents between Mac, PC, Iphone, ipad and android we do lose some of the message. Next time you're getting frustrated with your stakeholder about a misunderstanding therefore, you may want to consider if their communication preferences might explain the misunderstanding, and what you can do to plug the gap in their understanding. 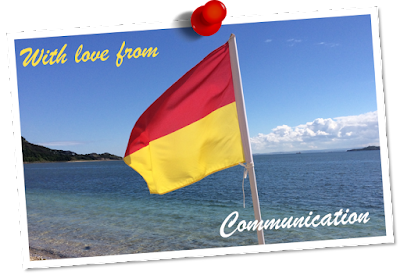 Communication is one of the postcards included in the Purchasing Coach Soft Skills Toolkit that brings together a series of postcards from your soft skills - it's entitled Dear Procurement, with love from your soft skills. More here. When I tell the story about the supplier and buyer taking equal ownership and responsibility for a new additional cost for delivering the service – a cost they could both impact in the future – the solution we developed is often described as fair, or acting with integrity. When I look up the organisational values of the supplier I find integrity, and doing the right thing - is in fact one of their stated values. In the case of this supplier the “we’ve never done that before” behaviour was certainly demonstrating doing the right thing. Do you understand how procurement actions align with your organisation’s values? Are procurement’s actions encompassed in the values statements? One company that has included procurement in their values statements is Whole Foods. How do your actions align with the stated values of your organisation? If you used these five criteria each day to determine what you do and how you do it, and also what you choose not to do, would it change how you act? Last year I was delivering a workshop to a room full of suppliers who said procurement were still like MrWolf. I’d like to think that that’s just the minority of procurement professionals. What do you think? Have we moved with the times, or are we still stuck with behaviours that feel a little like the dark ages, and misaligned from the rest of our organisations? It certainly might explain some of the stakeholder resistance many of us talk about when expressing frustration at the lack of support for our strategies and work. 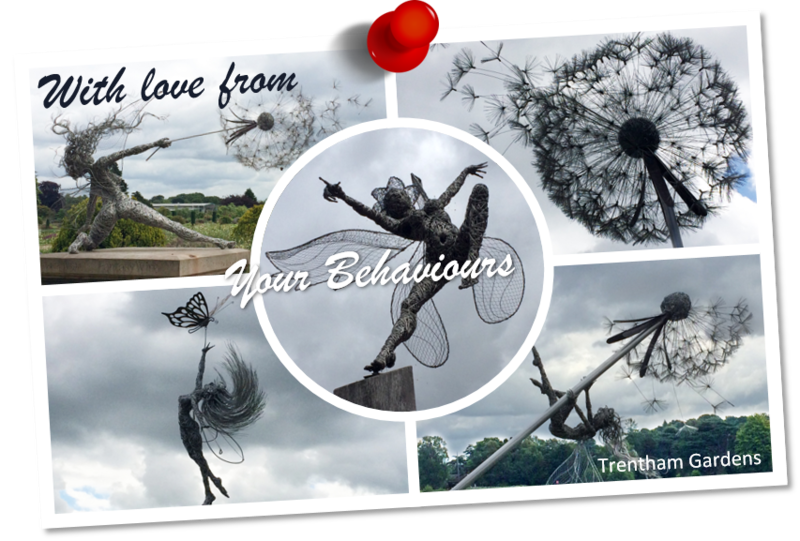 Values and Behaviours are two of the postcards included in the Purchasing Coach Soft Skills Toolkit that brings together a series of postcards from your soft skills - it's entitled Dear Procurement, with love from your soft skills. More here.